As the fight will be happening in the wee hours of the morning it’ll be slim pickings in terms of options for who’s going to be showing the fight. The Living Room usually stay open for these fights and sometimes have a live video linkup with a bar in the US, but unfortunately they’re currently closed for renovations. We’ve found 3 places showing it. Well, there’s a 4th, but they’re already sold out of wrist bands, so there’s no point in mentioning them. Sin Nightclub will be holding a ticketed event on the night. Tickets are €10 for early bird or €15 for general admission. They have 2 10ft screens and 3 plasma screens showing the fight live. Tickets are available via this link. 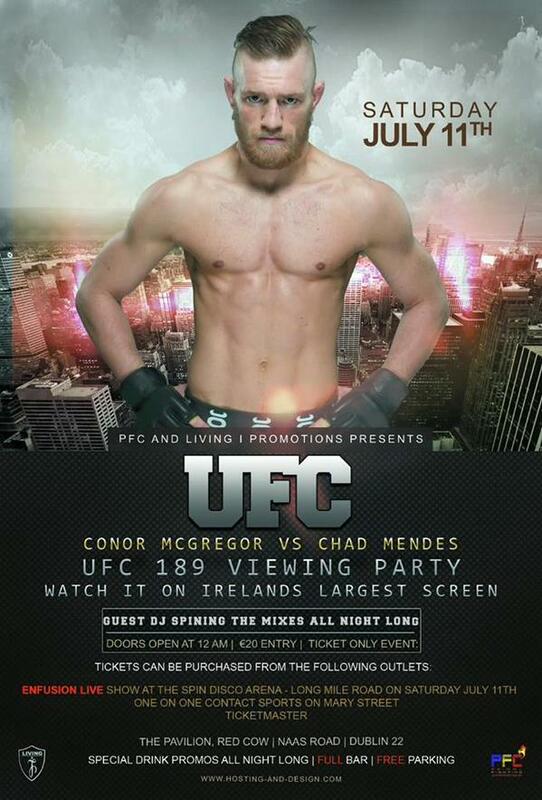 Krystle on Harcourt street will be showing the fight live and until the end. There’s no mention of an entrance fee or ticketing on their facebook event. Link to event. They’ll be having a ticketed event at the Pavillion for the fight. Tickets cost €20 and are available from ticketmaster and other outlets (Seen on the poster). They’ll open at midnight for the fight.